This post wants to examine with some detail the measurement of light intensity using the photon counting technique. We have already talked about it in other posts: Light as a Particle , Photon Counting. In this post we want to take particular care of the statistical distributions that are obtained in the photon counting measurements. In these experiments, the light incident on the PMT generates electrical impulses that are recorded by a counter, generating a statistical distribution of the photon counts. Different light sources – of low intensity – can be differentiated from the corresponding statistical distributions produced in the detection process. Depending on the properties of the light source, three statistical distribution are obtained: Poisson, Super-Poisson and Sub-Poisson. These schemes are defined by the relation between the variance Δn and the average number n of photon counts for the corresponding distribution. The Poisson distribution is characteristic of coherent light sources, such as lasers, while the Super-Poisson distribution describes better sources characterized by less coherence, such as LEDs. For completely non-coherent light sources, such as thermal sources, the statistical distribution becomes increasingly randomly distributed to resemble a Bose-Einstein distribution having the peak at the value 0. 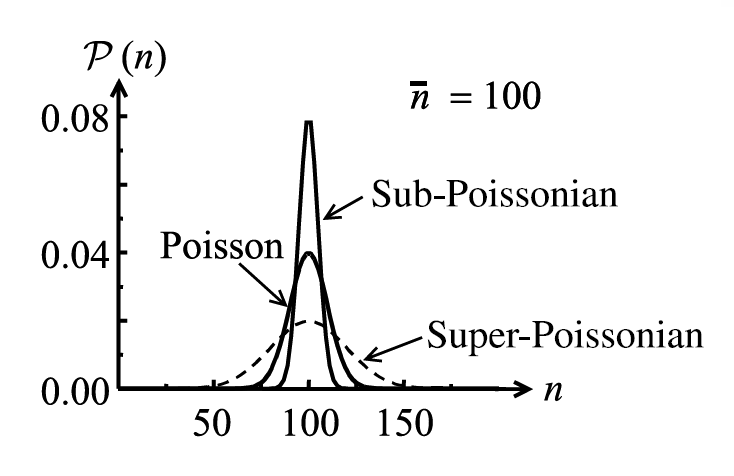 The Sub-Poisson distribution has an even narrower peak than the Poisson distribution and can be explained only by using quantum statistics: it is an example of quantum light, needless to say that its experimental observation is not that easy. It has been used the photomultiplier type H7828 Hamamatsu, which contains a 19mm photomultiplier tube, the high-speed circuit for counting photons and a power supply section that supplies the high voltage to the tube . The high voltage for the tube and the threshold level of the discriminator are pre-setup to the optimal level in order to allow operation of the module by simply connecting the power supply to + 5V. The spectral response of the phototube is from 300nm to 650nm, the sensor is therefore suitable to be used in the visible range. 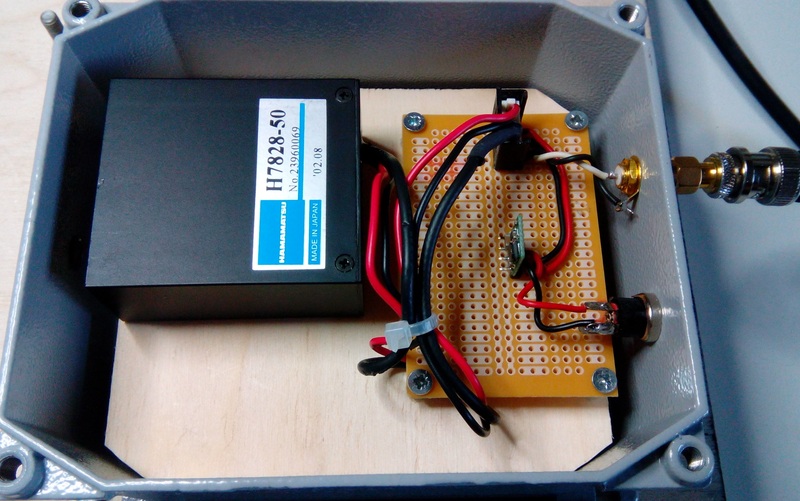 The image below shows the housing of the H7828 module inside a light-tight metal box, inside the box the + 5V voltage regulator has also been inserted. On one side of the box, in front of the sensitive area of ​​the PMT, a hole was made in order to allow the light to reach the photocathode of the photomultiplier. On this hole is then applied an aluminum strip with an even smaller opening (pin-hole) in order to further reduce the amount of light. The experimental setup consists of the “dark box” and the counting electronics described in the post. The “dark box” is a light-tight container inside which the metal box with the photomultiplier and the light source to be measured are placed. The interior of the dark box is shown in the initial image of the post, as you can see the inside of the box is painted black to reduce the inner reflections. Between the light source and the photomultiplier, some filters can be placed to decrease the intensity of the light in case of saturation of the photomultiplier. 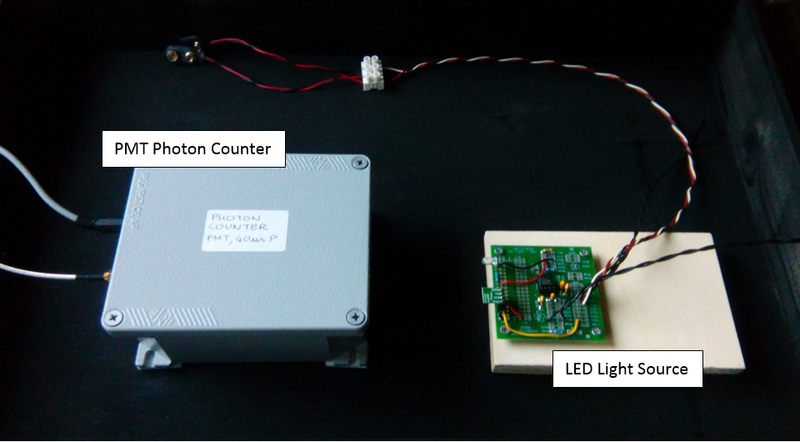 The “photon counter” counter device can be used in two modes: Simple Counter and Time Gated Counter. 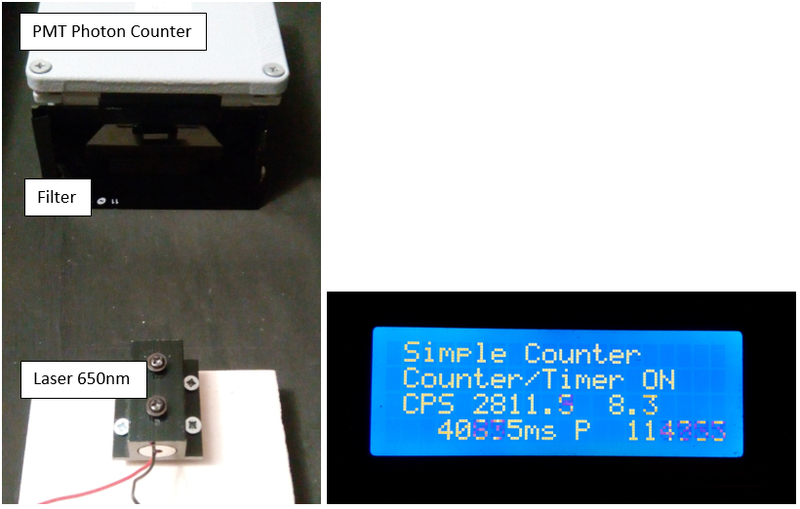 In the Simple Counter mode the counter performs continuous count and calculates the rate in CPS, together with the average square deviation. These values ​​are shown on the display together with the total measurement time and the number of recorded pulses. In the image below you can see the result of the measurement of the background noise of the PMT: even in conditions of complete darkness, an average of about 40 pulses per second is recorded. This is a low value, but we must take it into account in our measurements. In the “Time Gated Counter” mode the counter performs the count of the received pulses within a time window called Gate. During each new Gate pulse the count is executed and the result is shown on the display, together with the total measurement time and the number of Gate pulses received since the start. Gate pulses are obtained from a signal generator on which frequency and amplitude of the pulse can be programmed. In the image below you can see a frequency of 1 Hz with a time amplitude of 50 ms. The first light source we have measured is a 5 mW diode laser which emits red at 650nm. The laser was placed in front of the pin-hole of the PMT, shielded by a filter as seen in the image below. All inserted inside the dark box. The laser is driven by a current regulated power supply in order to produce a very weak but stable emission. In these conditions we can get a count of about 2000 – 3000 CPS. 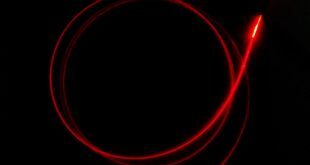 But are these really single photons ? With the following reasoning we can demonstrate it quite easily: 2000 CPS correspond to an average time interval between a photon and the next of about 0.5 ms. At this interval time the photon travels over 100,000 m, so the average spatial distance between a photon and the next is very large. Alternatively we can calculate that the time taken by a photon, after passing the filter, to reach the PMT is about 300 ps (distance equal to about 10 cm), enormously less than the average time separation measured between successive photons: this means that the space between source and detector is practically always empty! And those revealed are actually impulses due to single photons! Using the the counter in the “Time Gated Counter” mode we acquired the statistical distribution of the laser source emission. In practice we have counted the number of pulses received in a time window of 50 ms, the measurement was repeated for a time sufficient to acquire a congruous number of samples (about 5000). The data are transmitted from the counter to a RaspberryPI which provides for the registration and subsequent processing. The graph below shows the histogram obtained with the measurement, on the abscissa there is the number of photons recorded in the chosen time interval, in the ordinate the occurrences. The solid line corresponds instead to a calculated Poisson distribution. As you can see, the correspondence between the curve and the histogram is excellent. After the laser we made the same measurements with a LED source using the LED source described in the post : LED Dim Light Source. We adjusted the intensity up to a rate of about 1000 CPS, as shown in the image below. The charts below show the statistical distribution obtained with two gate time intervals: 20 ms and 50 ms. We note that the histograms are more spread than the Poisson function: we are therefore in the case of a Super-Poisson distribution, a sign that the light emitted by the LED has a lower degree of coherence than the laser light. The last measure has been done with the ambient light that we have left to enter in the dark box. Avoiding to seal the dark box perfectly you can obtain a photonic flux coming from the ambient light, we can assume this light completely incoherent. The average rate is 5000 CPS and we have chosen a 20 ms gate window. The statistical distribution obtained is shown in the following graph. You immediately notice a shape more spread compared to the Poisson distribution, but above all there is a strong presence of temporal intervals devoid of impulses or with few impulses: this is a sign that the source is highly incoherent and random and its distribution is close to the Bose-Einstein model.